Man, Blogger's being a real crankosaurus these days. It's taking me forever to load these images. Here's a Legionnaire whose greatness can be summed up quite concisely. 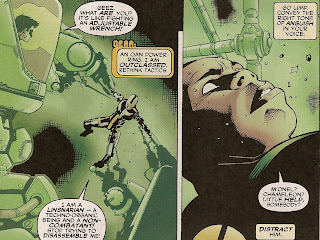 Gear was a member of the reboot Legion in the DnA era. Linsnarians are living-machine kinds of people, with humanoid-looking skin wrapped around a technological interior. 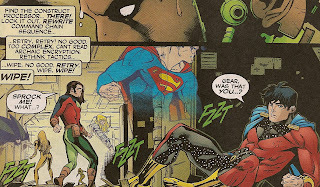 (In fact, I read something about the creators of the Legion animated series using Gear as a model for how Brainiac 5's appearance and powers would work on the show.) It was in this capacity that he was useful to the Legion: he tended to act as support staff more often than as an actual superhero. He was, nevertheless, a full-fledged Legionnaire.